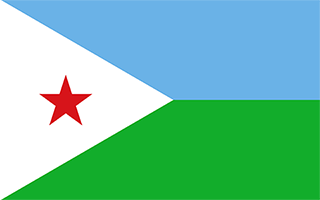 Djibouti with its capital Djibouti is located in Africa (Eastern Africa, bordering the Gulf of Aden and the Red Sea). It covers some 23,201 square kilometers (slightly smaller than New Jersey) with a population of 865,267. French, Arabic, Somali and Afar are the languages spoken by people in Djibouti (consider regional differences). Eritrea, Ethiopia and Somalia are bordering countries. Djibouti is in East Africa with the Gulf of Aden to the east. Djibouti's climate is very hot, humid and arid, especially in the summer. The summer heat is moderated, however, by a sustained breeze in the coastal city of Djibouti. From October to April, the temperature is cooler, with occasional rain. Casual wear is widely acceptable, but visitors are reminded that Djibouti is a Muslim country and certain codes of behavior should be observed. Shorts are generally not appropriate outside of hotels, beaches, or sport activities. Visitors should be aware of the risk of banditry if traveling outside the capital city. Be aware that the HIV/AIDS rate is currently over 3% or 1 in 33 adults. Protect yourself. Something you should definitely see is Lac Assal. 150m below seal level, Lake Assal is the third lowest point on Earth. Expect a rough ride: the roads outside the capital are destroyed by the truck traffic between Djibouti and Ethiopia. The road passes within sight of the Devil's Island, and some impressive views. Also scuba diving is a great activity to pursue while beeing there. Underwater off the coast lie several reefs teaming with all sorts of life. The terrain is coastal plain and plateau separated by central mountains. The average density of population is about 37 per km². The climate in Djibouti can be described as desert with torrid, dry. Possible natural disasters include droughts, earthquakes, experiences limited volcanic activity; Ardoukoba (298 m) last erupted in 1978; Manda-Inakir, located along the Ethiopian border, is also historically active and occasional cyclonic disturbances from the Indian Ocean bring heavy rains and flash floods. To reach someone Djibouti dial +253 prior to a number. The local cellular networks are operated on 900 MHz, 1800 MHz, 3G, 4G. Websites typically end with the top level domain ".dj". If you want to bring electric appliances (e.g. battery chaarger), keep in min the local 220 V - 50 Hz (plugs: C, E). The sign for the locally used currency Franc is DJF. Two equal horizontal bands of light blue (top) and light green with a white isosceles triangle based on the hoist side bearing a red five-pointed star in the center; blue stands for sea and sky and the Issa Somali people; green symbolizes earth and the Afar people; white represents peace; the red star recalls the struggle for independence and stands for unity. The French Territory of the Afars and the Issas became Djibouti in 1977. Hassan Gouled APTIDON installed an authoritarian one-party state and proceeded to serve as president until 1999. Unrest among the Afar minority during the 1990s led to a civil war that ended in 2001 with a peace accord between Afar rebels and the Somali Issa-dominated government. In 1999, Djibouti's first multiparty presidential election resulted in the election of Ismail Omar GUELLEH as president; he was reelected to a second term in 2005 and extended his tenure in office via a constitutional amendment, which allowed him to serve a third term in 2011 and begin a fourth term in 2016. Djibouti occupies a strategic geographic location at the intersection of the Red Sea and the Gulf of Aden and serves as an important shipping portal for goods entering and leaving the east African highlands and transshipments between Europe, the Middle East, and Asia. The government holds longstanding ties to France, which maintains a significant military presence in the country, and has strong ties with the US. Djibouti hosts several thousand members of US armed services at US-run Camp Lemonnier.